To help commemorate our 35th anniversary year, our Co-Founder and President Will Travers is embarking on his first-ever regional road trip. 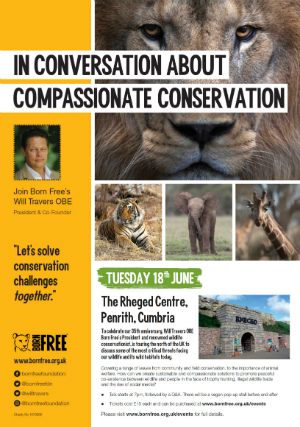 In Cumbria, Will is speaking under the green grass roof of the unique Penrith venue - RHEGED. This is a special opportunity for him to meet you - our wonderful supporters! So if you live in Edinburgh, Cumbria, Newcastle or Manchester, be sure to join him for a celebration of wildlife. He’ll be looking back over 35 years of our charity, and considering some of the most important issues facing wild animals today. *Please note that physical tickets will not be issued, so once you have booked, please print a copy of your confirmation email or save to your mobile device, and bring it along to the venue on the night for admission.